The service cap for army nurses was designed by Knox Hats. 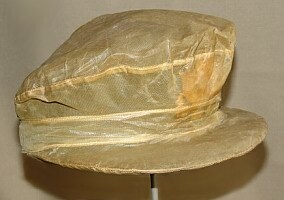 It had a quilted cloth visor and a 1-inch front strap, ending in a flat bow at the center front of the cap. It was issued in blue and beige to match the winter and the summer service uniform. Beige Service Cap (1st pattern) . .Side view of the second pattern service cap ..... 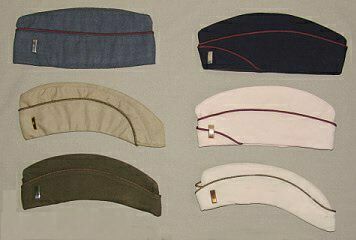 Since this initial cap design was not shaped to the head and the visor was too broad, an improved pattern with a close-fitting body, a smaller stitched, semirigid visor and a narrow front strap was introduced in November 1942. The flat bow was eliminated and the front of the cap lifted and reinforced to support the weight of the cap device. for rain protection of the service caps. 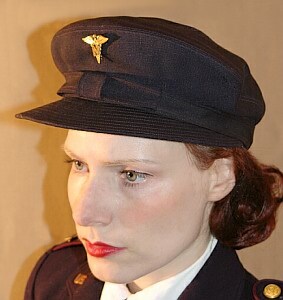 Army nurses were issued a dark blue garrison cap (#2) for wear with the dark blue uniform. 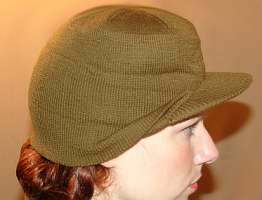 The dark olive-drab WAC garrison cap (#5) was adopted for nurses in June 1944. It was worn with the dark olive-drab uniform. 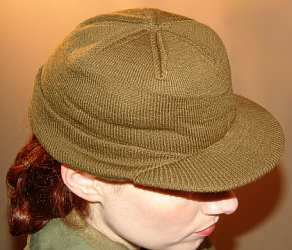 A beige garrison cap (#4) in the same style as the dark blue garrison cap could be worn with the beige summer uniform. 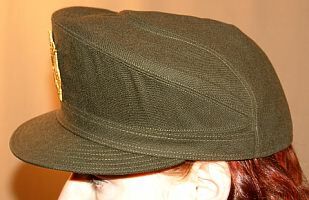 Later it was replaced by a female pattern garrison cap with gold-black officer's piping (#6). Flight Nurses wore a men's style blue garrison cap ( #1) with maroon piping with their blue flight nurse's uniform. 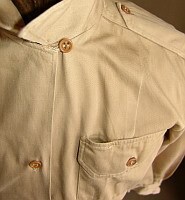 A matching khaki K-1 Flight Nurse's Cap was worn with the K-1 Flight Nurse's Uniform (#3). .
.. The white linen cap for nurses had remained unchanged in style and fabric since 1933. It had a 3 1/2 inch double band in front, attached to a crown which was shirredin by draw tapes at the bottom. 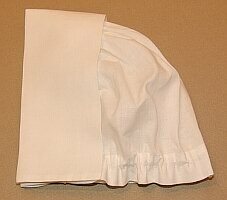 The cap was made of plain weave, 2.3 ounce white handkerchief linen. The difficulty of laudering this cap was often criticized. In the summer of 1944 the white cap was discarded together with the white hospital dress. A special matching cap was worn with the brown and white-striped seersucker hospital uniform. It was an item of issue and standarized in December 1942. It could be opened and laid flat for easy laundering and packing. ..
Army Nurses wore the wool knit cap with the Herringbone Twill work uniform or other field clothing. ..
. The double fold of this wool knit cap with reinforced visor could be pulled down over the ears for warmth (like shown on the right photo). The same cap was also issued to Army men.
. made of dark olive drab broadcloth. 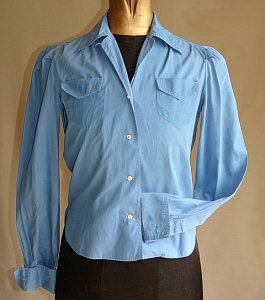 This shirtwaist was an optional item for female army nurses. 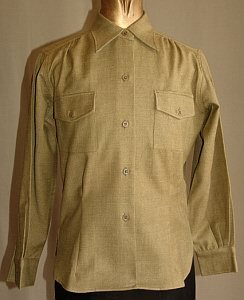 It was worn with the olive drab summr service jacket and a khaki tie. 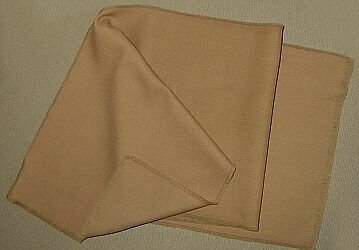 The waist shown on the picture has two breast pockets with pleats and buttoned flaps. 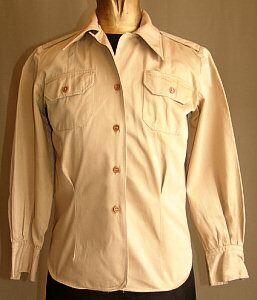 The shirt was made of cotton khaki cloth. Left flap and pocket provided with pencil opening. It has a loop and button for neck closure and shoulder loops. 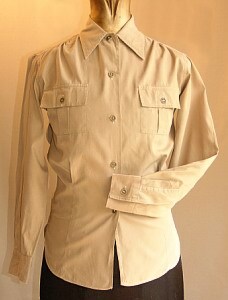 This shirt was worn with the cotton khaki slacks. Army Nurses wore a black tie with their blue service uniform and the first pattern beige uniform. 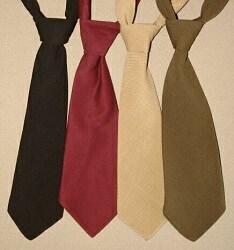 A maroon tie was worn with the second pattern beige summer uniform and a khaki tie with their olive-drab uniform. Scarf, Women's ... Like WAC personnel, Army nurses received an all-wool scarf in twill weave for wear with the olive drab winter service uniform. It was lightweight and soft to the touch. Gloves in different colors were worn with the different service uniforms: gray suede gloves with the blue service uniform, white gloves with the early pattern beige uniform. 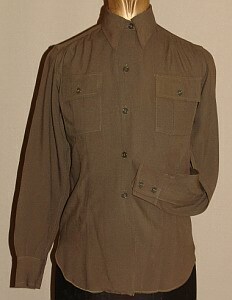 Brown leather gloves were worn with the olive drab uniforms. 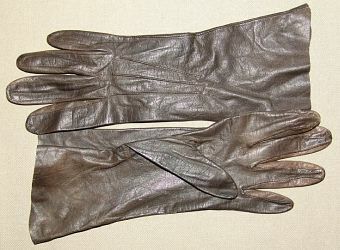 Brown Dress Gloves which belonged to an Army Nurse in WWII. 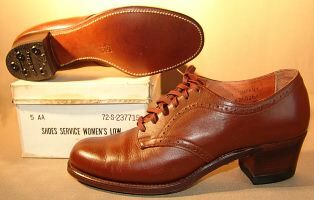 Oxford shoes dominated the footwear of women's organizations during WWII. 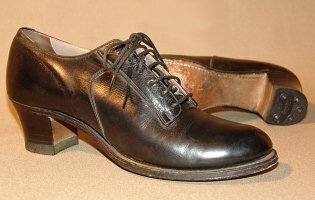 Black oxford shoes were worn with the blue service uniform. White oxford shoes were worn with the ward uniform and the beige summer service uniform. .
... Black Oxford Shoes Example of 1940s black oxford shoes as they could have been used by Army Nurses. 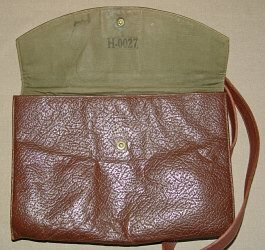 The service shoes for the olive drab uniform were made of leather, in golden tobacco brown shade that matched the ANC utility purse and leather dress gloves. 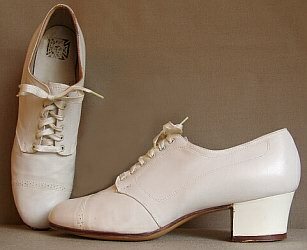 These shoes could also be worn with the beige summer uniform and the brown and white seersucker uniform. ... ANC members could wear privately purchased leather pumps with no decorative features, closed toe and heel, and with heel height not over 2 1/2 inches with their off-duty dresses since September 1945. 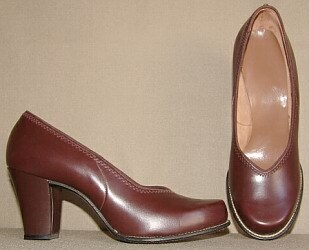 Left picture: Example of plain 1940s brown pumps which could be worn with the olive-drab off-duty dress or the beige summer off-duty dress. Black pumps could be worn to the blue off-duty dress. The rubber type overshoe fits over the low type shoe. 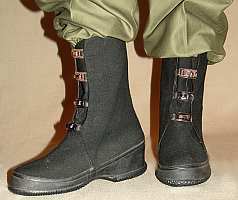 This Arctic type overshoe fit over the women's field shoes. It comes halfway up the leg to protect against snow and cold. They are made of woven, water-repellent, cashmerette upper and have rubber soles. 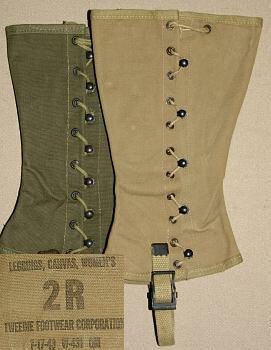 The women's leggings were similar in design to the leggings worn by the enlisted men. They differed in the lower height. 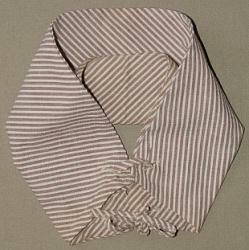 They were worn with the herringbone twill trousers for protection in the field and against insects. They could also be worn with the outer cover trousers. 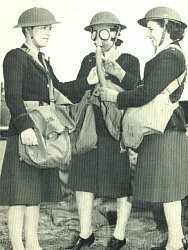 Before the female version was developed and in case of supply shortage, WACs often wore men's leggings. .. Boots, Service Combat, Women's . In June 1944, the development of an additional field shoe was initiated for heavy field usage for WACs and Army Nurses. It should be equipped with heavier sole and higher cut at the top in order to hold in the trouser leg (thereby eleminating the need for wearing leggings). Female Army personnel serving in North Africa and Europe already had used men's combat boots or had sewn leather tops on their field shoes to avoid the disliked leggings. 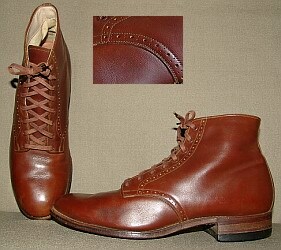 The design and construction of the men's combat boots was adopted. The only difference was that the height was 9 inch (1 1/2 inch less than the men's version). 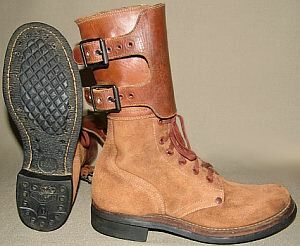 The leather in the lower part of the boots had the rough side on the outside with the smooth side used inside the boot to give greater foot comfort. 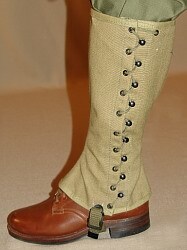 The field boots were approved by Headquarters, ASF, at the end of December 1944. Field / Individual Equipment . 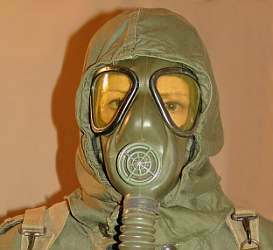 After the experiences of World War I, everyone was afraid that the enemy would use gas attacks with toxic agents such as phosgene and mustard gas as most destructive weapon. Therefore, much attention was paid to research protection possibilities and supply all soldiers with sufficient equipment. 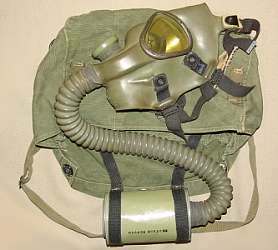 This type of gas mask was mainly supplied to members of the WAC and ANC. Unfortunately, these masks worked defective under winter conditions. 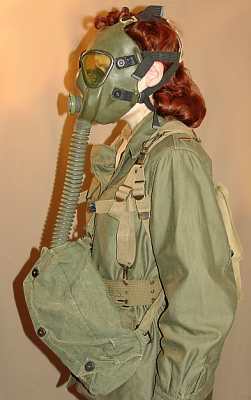 Using a hood as additional protection was especially necessary in case of a mustard gas attack because the bare neck was extremely vulnerable to the effects of this kind of toxic agent. .. 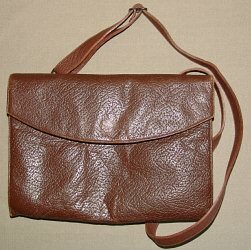 The brown leather handbag with pockets and change purse had a lining made of od colored cotton poplin. 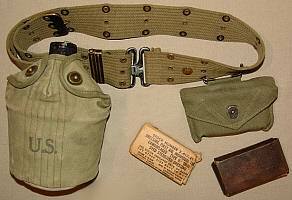 The strap could be adjusted for wearing over the shoulder or shortened for carrying in the hand. It was also possible to remove the strap alltogether and carry the handbag under the arm.
. Except for the utility bag, ANC personnel received the same canvas field bag as Army men. 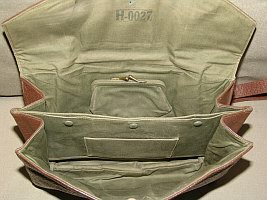 It was used to carry personal equipment in the field.
. 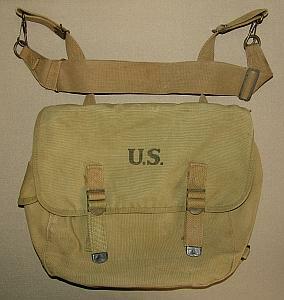 It could be worn over the shoulder when using the carrying strap (the attached strap is shown on the picture) or on the back using belt suspenders. .
. 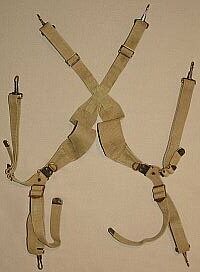 The suspenders could be used to support the various types of ammunition belts and also to carry the canvas field bag. The identification-tag was attached to an identification-tag chain worn about the neck. 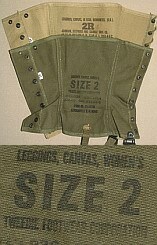 The tags had to be worn at all times in the field (including aboard ships and airplanes). They should not be removed and one showered and performed other personal hygiene while wearing them. 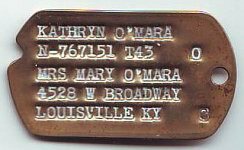 In the early war years, brass or monel metal (a patented corrosion-resistant alloy made of brass and nickel) was used to fabricate the tags. Due to material shortages, stainless steel became a common substitute material by the end of March 1942. 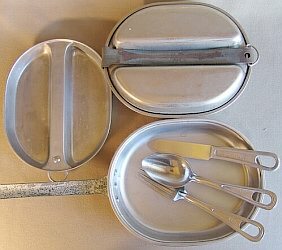 During the time from late 1943 to early 1944, the production was entirely switched to stainless steel metal. The Army Nurse's serial numbers started with the prefix "N" followed by a series of 6 digits. The Tetanus vaccination was indicated by the letter "T" followed by the date of the tetanus vaccination (e.g. T43) and usually also the date of its combined diphtheria toxoid (e.g. T43 44).
. Religion and Dog Tags during World War II . The religion was indicated by "P" for Protestant, "C" for Catholic or "H" for Hebrew (Jewish). The letters "NO" or no letters (blank) were printed in case of no specific religious preference from the three choices. This would be the case for certain Native American creeds, Moslem, nonbelievers etc. In American pre-Civil War Southern culture, the "Code Noir" of French Catholic Louisiana had mandated baptism and adherence to the Catholic church for all slaves. The code was modified and adopted throughout the South to punish all slave assemblies except for Christian worship, for fear of otherwise being plots or revolts. Many great-grandsons of slaves (the WW2 generation) thus resented Christianity as a "slaveholder religion" and continued to practice African religious syncretism or traditional religions, mixed with Voodoo and black magic widely imported to America from Haiti and Cuba. As a result, many dog tags of Black service personnel were blank or "NO" for Religion. Most American Indians continued to practice their own Native American Creeds. Additionally, during the war, many Jewish servicemen and servicewomen did not select any preference and left their dog tags either blank or "NO" because an "H" was a death sentence if captured by the Germans. Finally, there were thousands of nonbelievers in the service. 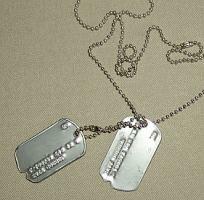 Therefore, many military dog tags of WW2 did not carry a Religious Preference.